September was a bit of a bumpy month for me–literally. About 3 weeks ago, walking full speed and barefoot, I ran my left little toe smack into one of the hardwood claw feet on my couch. The impact separated it from the rest of my toes, and instantly I knew I was in very painful trouble. My whole foot swelled and turned all colors of the rainbow, and from what I could tell (based on my accident prone experience), my poor little toe was probably broken. It couldn’t move. It couldn’t help me “spread my feet like stars.” I kept it wrapped in a comfrey leaf poultice inside a sock and took lots of homeopathic arnica and rescue remedy. After 3 days the swelling went down enough that I could put my Nikes on again when I gimped out to take Romeo for a walk. After about 5 days I could do without the comfrey poultice. The bruising looked worse, but my foot was getting better. And now I am happy to report that in the last 48 hours or so, I have regained full motion of that little toe, and am happily spreading my feet like stars, even if it is still a little stiff now and then. Somewhere around the time I was taking off the comfrey poultice, I burned the roof of my mouth. It was worse than I thought, and so I accidentally burned it again. And again. As a result, I had to resort to food I knew would literally help the inflamed tissue heal. And one of the best foods for that is oats. 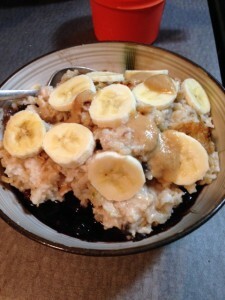 Just when I think I’ve done everything I can do with oats or oatmeal, I discover another fun way to eat it. 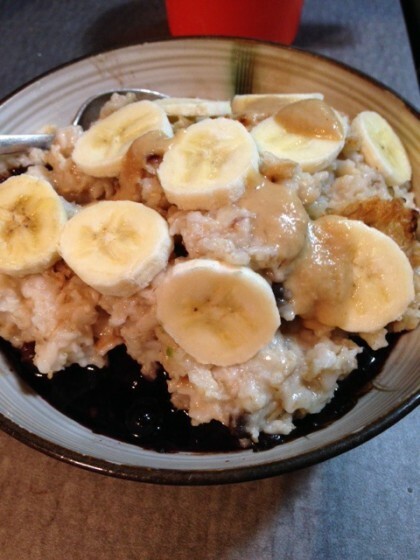 In the summer I enjoyed banana ice cream with oats sprinkled over the top. But with the burn on the roof of my mouth, the raw oats were too scratchy. So I went back to my old stand-by, cooked oats. Cooled off enough, they are the perfect “salve” for a burn on the inside of my mouth. This upside down sundae originated in part because having the oats on top of the carob fudge and frozen fruit instead of the other way around helped them cool off to room temperature more quickly. 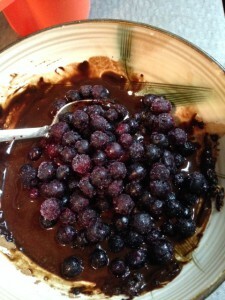 Scooping into them to find a cool combination of carob sauce and blueberries underneath is a real treat. This can be eaten both as a breakfast and a dessert. And frankly, I’ve been eating it as both, often on the same day, even though the burn on the roof of my mouth is all healed now. I have read eating oats at night helps lower cholesterol. So why not have them at both the head of my day, and the toe of it as well? Put all these in a saucepan and bring to a simmer. Cook until all the water is absorbed. Turn off the heat and let sit for a few minutes. When the oats have cooled enough, scoop them out of the saucepan with a wooden spoon and mound them on top of the carob/blueberry mixture. Top with slices of banana and a few dabs of tahini, if desired. Makes one big serving of sweet and healing comfort food. These “toe to head” experiences remind me that sometimes it’s mandatory to slow down, and if I am unable or unwilling to slow down enough, my body will find a way to make sure I do. And thanks to these “bumps,” I am no longer in residual flight from the hectic events of my move. I look where I am going and pace myself. 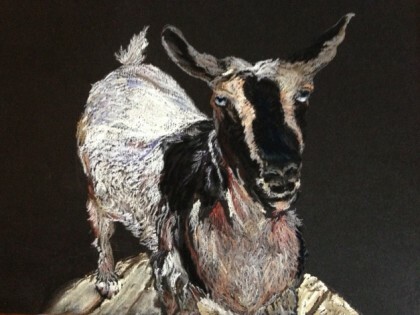 Another silver lining is that I was able to take a lovely slow time to complete my soulful goat pastel. So it isn’t all bad to have my goat gotten. And eat my oatmeal like a decadent ice cream sundae. I can actually say it makes me feel great from head to toe. Ouch Ouch Ouch. Glad you are healing. Love oatmeal for any meal too. I love your goat pastel! That Alpine goat looks so real I want to reach out a pet it. There is life in his eyes and they seem to be saying, “If you haven’t brought me anything good to eat, what good are you?” I see a goat with attitude! I really thought it was a photograph and was amazed when I read it was a pastel. Glad you are feeling better and hope the remainder of October is injury free for you. Oh Sheila, I laughed so hard when I read this–yes!! I bring them all kale stems and this guy is the shyest and often gets butted out of the way, despite my best efforts. I took this after the kale was all gone and he’d missed most of it. He got up on a hug wooden spool and just looked at me mournfully. Thank you so much for your kind words about the pastel and you wishes for an injury-free October, too! Wait, you painted that?? Wow, I thought it was a photo at first! Anything categorized as “breakfast or dessert” gets my undivided attention. I’m oat-free so I’ll try a hot rice cereal version. With the chilly weather setting in I’ve been wanting every meal to be hot and in a bowl so I can wrap my hands around it. Oh Maria, so sorry about your bumpy September with two painful injuries! Glad to hear both have already healed with your loving self-care. Your oatmeal recipe looks scrumptious & I absolutely adore your finished goat pastel…….wow, how fun to have watched it evolve. Here’s to a much safer October! I’m happy your toe is healing! Ouch. That sundae looks so good I am going to make myself some breakfast oats right now. 🙂 I often have a little oatmeal and fruit for dessert. It’s amazing how it is just the thing to have on a cool evening a few hours after an early dinner. Eep! I actually winced when I read about your toe- I bump into stuff all the time, and the toe is always the worst! I’m glad it healed up well. Anyway, the oatmeal sundae does sound soothing–wish I’d thought of it back when I had a sore throat and cough a few weeks ago! I hope you’re feeling better, Romeo is back on his walk schedule, and that the goat has found a place of honor in a gallery–it’s gorgeous! Lee, I laughed out loud when I read this–mixed martial arts AND bank robbery it is! Glad you find the oatmeal sundae soothing, too. Thanks for your kind words–we kept on walking, but we didn’t get real far. Still it was good to keep my legs moving. I would love it if my goat found a place of honor in a gallery some day–thanks for thinking such good thoughts for it! Maria, I love this. Oats are one of my all time favorite foods, and one of the reasons for this is that I could (literally) eat them for breakfast, lunch, dinner, and dessert, depending on my mood and what ingredients I use. Your recipe is both a wonderful breakfast and an uber-healthy dessert — I could see myself whipping it up on a long night of studying, when I start to crave treats but don’t want to invite too much glucose into my system!